Dresco has been manufacturing precision steel components for over thirty years. A good example of our capabilities is the steel housing highlighted here. It was designed for use in a military vehicles commanders hatch. Composed of steel plate and aircraft quality 4130 alloy steel, we employed numerous capabilities in its manufacture. Raw material was cut on our waterjets and further machined on CNC mills. Other components were turned on CNC lathes and further machined in secondary operations. The whole assembly was welded and then final machined and honed. To maintain the highest quality during this process, our team employed dimensional and visual inspections throughout manufacture to ensure that that all dimensions and tolerances were met. 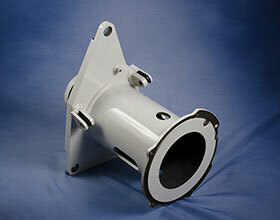 A number of other processes were utilized to finish this assembly including phosphate, dry lube coating and painting. This housing was manufactured in compliance with various industry and military standards including AWS D1.1, MIL-STD-1261, MIL-STD-171 and MIL-STD-130 to name a few. 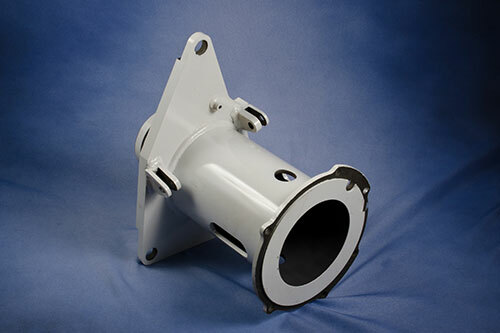 We produced 212 of these housings for our customer and shipped to Anniston, Alabama with a turnaround time of just 12-14 weeks. To learn more about this project or to inquire about how our company can help with your project, please contact us directly.